- Revue Nègre Dance (1926). 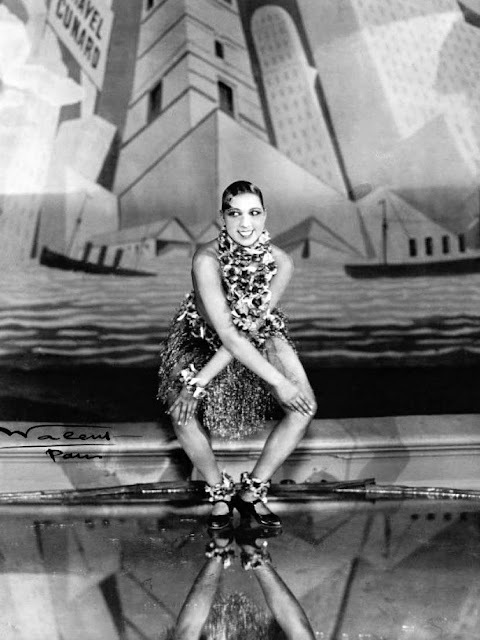 Finding out about Josephine Baker is an insightful experience. This is the 1920s..... and a woman of colour is taking Paris by storm. She started life in 1906 as the daughter of a washerwoman in Missouri USA. Her first jobs were as a cleaner. She ended up being one of the most exciting dancers of her time. I you-tubed some old films of her, one as late as 1974 which shows a splended woman with a marvellous voice, taking centre stage to an acclaiming audience. A year later she passed away and had a funeral in Paris which attracted thousands of followers. If you watch Baker dance, it seems as if she cannot stop once the music starts. She jives and jiggles and jumps and romps about with inexhaustible energy. More importantly, she was a woman of colour, taking centre stage in a white man's world. Amongst the many curiousities of her lifetime, please note that she adopted 12 children which is no mean feat; was named a Chevalier of the Legion of Honor by the French government. Hi there-a lovely post and photos, she really was a stunning lady!! I highly recommend the 1991 movie starring Lynn Whitfield as Josephine Baker. It was really good! Fabulous post. She was beautiful to boot!